If someone were to tell you that Admiral Halsey, the great American Naval Hero of World War Two, had almost been Court Martialed at the height of the war, you would not believe it. I know I didn't! And I am a big fan of history- Naval History in particular. In December of 1944 Douglas MacArthur was due to return to the Phillipines, just as he had promised 3 years earlier. Admirals King and Halsey had made this possible through a series of "island hopping" invasions. They were highly sucessful in their endeavors and so by the time of these events all was in place for that return. But a seies of lapses, most notably in the weather predictions, led the fleet into one of the worst typhoons in history. Almost 800 men from 4 different ships perished in this storm. Aboard one of the vessels was a young Seaman named Gerald Ford, who would later go on to become President of the United States. This book will have you white knuckled all the way through. And leaves me wondering, once again, why I bother to write about my own life at all. Any of my worst experiences pale in comparison to what these men went through. As an interesting aside, this book describes in great detail, the events that were later captured in the best seller by Herman Wouk, "The Caine Mutiny." Mr. Wouk served in the Pacific during the time of these events. His experience certainly led to the realistic description of that storm. 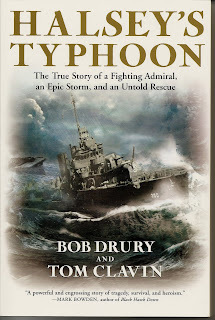 As a matter of fact the chapters describing the mutiny on the ficticous USS Caine are right in line with what actually took place aboard the USS Hull at the height of the real typhoon. This book is a must read for all Naval History buffs. And also for those looking to see beyond the legend of Admiral Halsey. Written with great energy and style, this book is a page turner.